All plant material is organically grown in my garden and or ethically wild crafted in the Trinity Mountains. 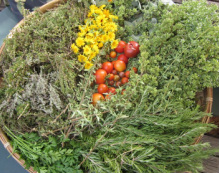 The herbs are harvested , dried, cut and sifted, season by season so I can offer fresh, colorful and fragrant herbs to my customers. 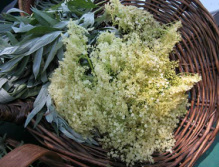 Herb de Provence - Herbs of Hyampom, grown in my garden. This aromatic herb blend is based on the French formula, a wonderful addition to your kitchen. The restorative benefits of herbal tea infusion and decoctions have been part of the healing and curing for thousand's of years, soothing, stimulating and comforting. Tea became an important part of our ritual and I here is a quote by Henry James 1881: "
"there are few hours in life more agreeable then the hour dedicated to the afternoon tea ceremony"
Dream Time - an aromatic herbal tea blend for peaceful sleep and sweet dreams. Contains Passionflower, Melissa, Lavender blossoms, Cinnamon, Chamomile, Spearmint. Fleur de Jamaica - a rich fruity flavor with a hint of the tropics. A wonderful red tea blend to be enjoyed hot or cold in the summer month as a "sun tea". Contains Hibiscus flower, Lemongrass, Rose petals, Spearmint, Orange peel, Stevia. Cleanse Blend - a rich fully flavored decoction of roots, seeds and bark. The herbs are knows as a tonic, a cleanse as well as a support to the digestive tract, liver and blood. Contains Burdock root, Dandelion root, Fennel, Licorice root, Fenugreek, Star Anise, Comfrey root. High Vitamin & Mineral Blend - a delicious healthy tea infusion with a wealth of vitamins and minerals that are found in Nettle, Red Clover, Oatstraw, Rosehips, Chamomile, Horsetail, Spearmint. Essiac Tea - is known to help build the immune system and purify the body of toxins. The original formula has been given by Native American Indians to a Canadian nurse caring for cancer patients. Read more about Essiac tea in a separate attachment. disease, nor are they intended as a prescription or therapy in any way. The descriptions are for educational purpose only. None of the statements on this web-site have been evaluated by the FDA.